Divide into teams, draw a word card from the deck. Use the shapes and bits and pieces to build a model of the word. Get your teams mates to guess correctly within the allotted time. 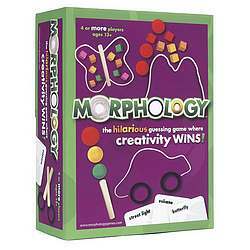 The Morphologist is the builder each round and rotates with each team. Without talking, the Morphologist must ‘morph’ the pieces into the word. Each time the team correctly guesses the word in the 1 minute allowed, they move forward one lily pad. Then the die is passed to the left. But be ready - the board will take twists and turns as you hop your way through! When you land on a lily pad that says roll, you must roll the die and watch your creativity and laughter grow! The first team to reach finish wins.